On 1st January 2009, over a few glasses of orange juice (or so the story goes), Simply Grey (www.simplygrey.co.nz) was born. 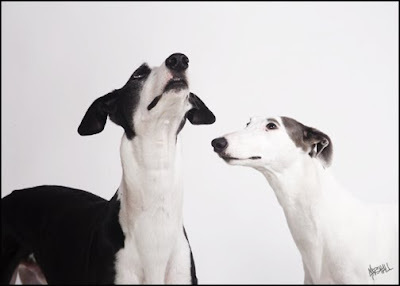 Cate Marshall (Photographer / GAP Southern Regional Coordinator) and Sonja Bright (GAP Kennel Manager) had a vision to celebrate the greyhound through photography. Within a matter of weeks a website was built, a bank account opened and a Gallery booked for the first exhibition. There was one small hitch – no funding to get the project off the ground and images on the wall! Being two determined women with a like-minded passion for greyhounds and naturally, photography, Cate and Sonja were determined to make the dream a reality. Cate is a familiar face on the Addington race track (photographer, dog handler for trainer Gary Cleeve and GAP spokesperson) so the team (Cate and Sonja that is) approached Club Secretary Tony Music of the Christchurch Greyhound Racing Club unsure of what his reaction would be to an artistic project about greyhounds. Quite simply, he loved it! Sonja – Festival Producer and Event Manager in years gone by - dusted off the cobwebs and drew up a sponsorship proposal: the club accepted it, presented Cate with a cheque at the Auckland Cup (Cate was there with her GAP hat on) and the Christchurch exhibition was a reality. A similar proposal went to NZ Greyhound Racing which was accepted and funding given for a series of exhibitions around the country. Finally, Kirsten Wylie of Total Veterinary Services came on board as a sponsor and Cate started creating work in a 3 day shoot in her home studio with a small group of eager models, and trackside at trials and race meetings. The stunning exhibition at the Christchurch Arts Centre attracted an audience of over 600 including trainers and racing owners (many with a tear in their eye), GAP owners, dog lovers, photographers and other artists, regular Arts Centre visitors and the general public, many of whom had seen Cate on Canterbury TV with Grace draped over her lap. Simply Grey is an avid supporter of GAP and close to $1,000 has been raised thus far through donations, a national raffle and merchandise sales. The dust hadn’t settled post-exhibition and Sonja had a photo shoot organised for Cate in Palmerston North (thanks to GAP owner Kevin Darling of Gribbles Veterinary, who provided an empty warehouse big enough to drive a Mini in. But that’s another story...), an idea for a 2010 Calendar and exhibitions for Palmerston North and Wellington. A staggering amount of work was created at the recent shoot where the team were driven by a tight schedule on a miniscule budget and too much caffeine. Just as Cate was about to head home to Christchurch to start editing, Ashoka Pandey of the Manawatu Racing Club got wind of the project, invited Cate and Sonja along to the track for coffee and a sandwich and promptly named a race The Simply Grey Project Middle Distance at a recent meeting! 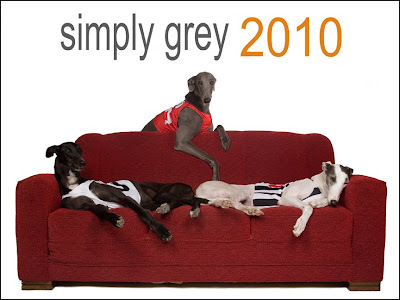 The 2010 SimplyGrey calendar is about to be printed and you can order it via GAP. Simply Grey donates a minimum of 10% of proceeds to GAP (15% from calendar sales) - so order yours now!